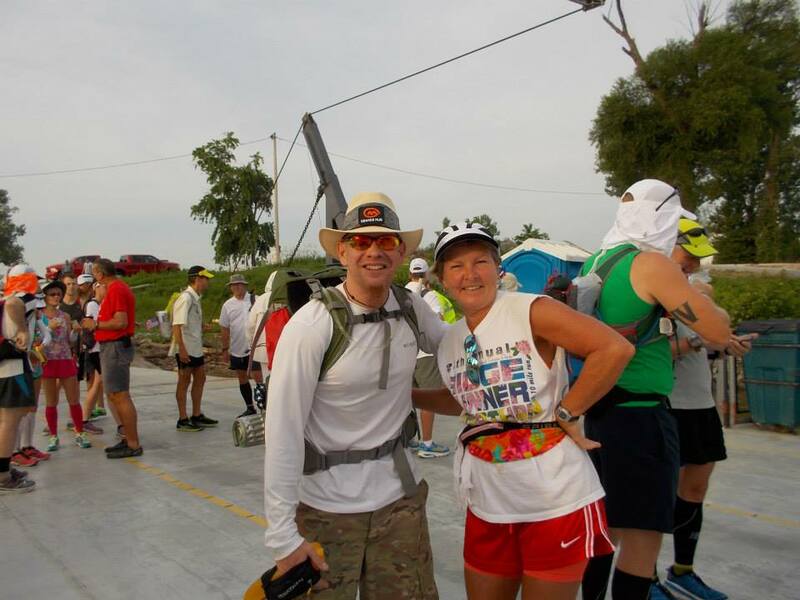 Editor’s note: This is part 1 of a three-part series of a trans-Tennessee footrace earlier this month. Chris Knodel snapped this photo while crossing the Tennessee River around Mile 112, or roughly one-third of the way through the footrace. 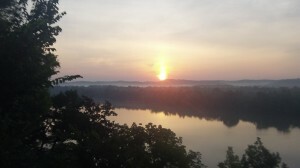 Of all of the races for which I have registered, the Last Annual Vol State 500K weighed heaviest on my mind. It wasn’t my first stage race, and I was certain the trials and efforts of my Iceland trek would far exceed that of this trans-Tennessee crossing, but Vol State continued to weigh me down. Admittedly, part of this was that the race director, Lazarus Lake, is the creator and current sadist over the Barkley Marathon — touted as the hardest 100-plus mile race in existence. The other factor was the email list that I “subscribed” to unknowingly. This antiquated list-serve was a cacophony of irrelevant and often contradictory information. In most cases, no one uses a massive list-serve anymore, particularly one that sends every comment and response to every member. From the second I hit “agree,” my email inbox blew up by 25-50 emails a day, all from the banter of the VS registrants (old and new). And the more I read, the dumber I became. I literally felt that I was worse off every time I opened a message. By two weeks out from the race, I deleted every message not initiated by the RD. Each morning I felt more uptight. I panicked and wrote Laz an email asking for a single document outlining the entire process and everything I would be expected to know. He replied back that one was attached, and that relaxed me — for a while. Keep in mind that after I registered for Vol State, I registered for my fourth 100-miler in Arizona, the TransRockies and Silverton races in Col., the Tarheel Ultra in North Carolina, agreed to pace buddies in Calif. (Western States) and possibly Rockingham (Hinson Lake), and registered for a 3,100-mile trek across the U.S.
My plate felt very full, and the more I analyzed this initial trans-state crossing, the more unsettled I felt. The good news was that this would be a great proving ground for the donated gear I had received for the Race Across the USA; conversely, using a race as an experiment is rarely a good idea. Best to view Vol State simply as a training run. Chris Knodel at the start, fresh off the ferry crossing from Missouri to Kentucky. Vol State begins with a ferry crossing from Missouri to Kentucky, transverses 275 miles of Tennessee roads, and then climbs the rolling hills of Alabama to terminate in Georgia at “the Rock.” Flat terrain becomes the rolling hills that give way to the Appalachians each step of the way. The rules are simple. Follow the route map any way you can with everything you need (if you elected to go un-aided, or “screwed,” as Laz dubs it). To finish in the allotted 10 days, one must average a 50K per day for the entire 314-mile linear stretch. You can stop at any time, stay in a hotel, tent or park bench, eat when and where you please, but you must make progress or you could be pulled from the course. No pressure there. My plan for the Last Annual Vol State 500K was pretty simple. I was going to carry my Iceland pack with a drastically reduced packing list. I carried no additional clothes other than what I wore. 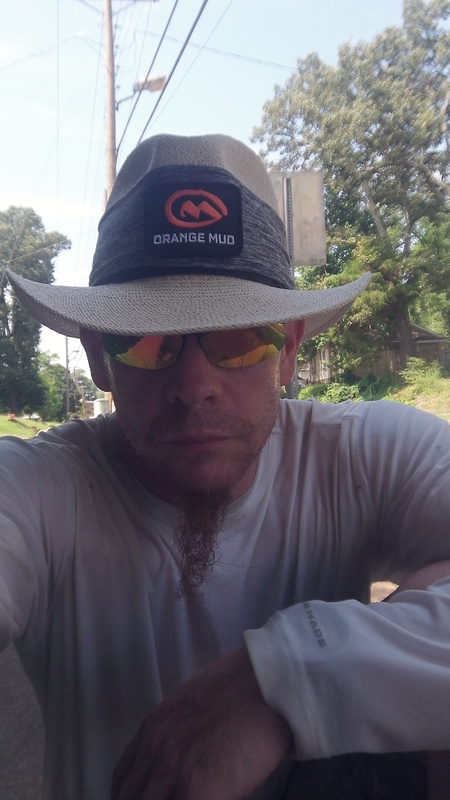 I was dressed in a Panama hat; sunglasses; a long-sleeve, heat-dissipating tech shirt; a modified pair of Army battle fatigue “shorts;” spandex undergarments; and Vibrams with the optional Luna Sandal if my feet began to get sore. 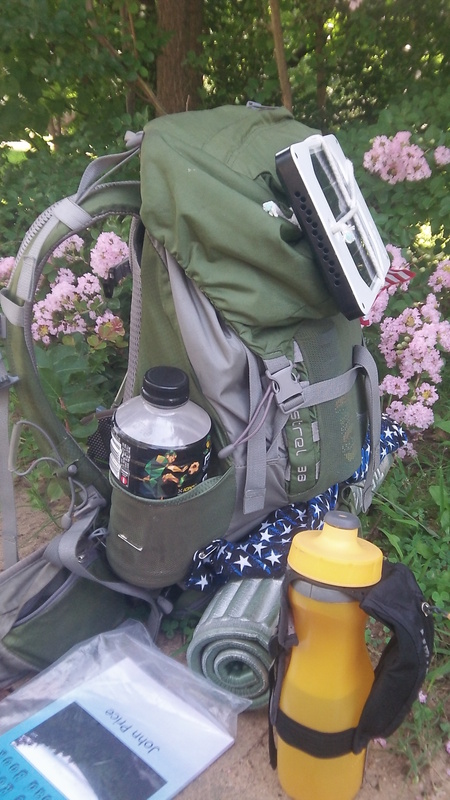 Chris Knodel snapped a pic of his gear around Mile 55 of the 500-kilometer journey. The pack would have 100 ounces/3-Liters of water (6.5 pounds); a solar panel to recharge my watch, iPod, camera, headlamp and iPhone (collective of 6.5 pounds); emergency bivvy, lightweight jacket, buff, rain jacket and sleeping cocoon (collective weight of 2 pounds); trekking poles, bear spray and sunblock/sunscreen/hygiene products (collective weight of 4.5 pounds); and 22,000 calories worth of food (collective weight of 5.5 pounds). With wet weather bags, pack weight, the clothes I wore, handheld water bottle and incidentals, full load was around 30 pounds. Most of the gear was new to me, and I really wanted to see what it could do — so for almost six weeks leading up to the VolState, I carried weight while I ran, drug a tire, or both. Chris Knodel is a Mangum Track Club member and Sandhills Region native. He is the author of “More, Better Quicker – The Irish Goat: A Fat-Boy & His Path to Ultra-Distance.” His column will appear each Thursday on PeeDeePost.com. Good addition and it will be nice to read about the adventures of the Irish Goat.